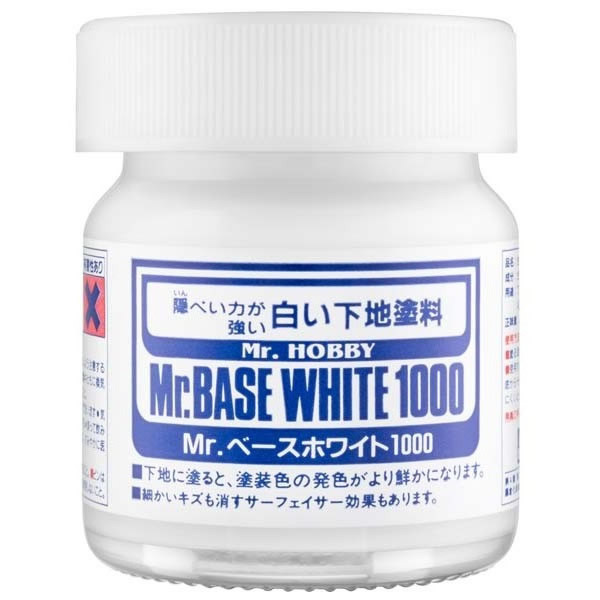 Mr. BASE WHITE is useful for making a black, red or other dark-colored surface white. This newly developed product uses special pigments to completely hide the base color and aids application of detailed finishing and top coats. Because it also works as a surfacer, it can be used to hide small imperfections. Clean the surface with sandpaper before applying surfacer, + after applying surfacer, kindly wait for a moment until the surface dries. - How long to wait for the this white base1000 to dry? Normally at minimum of time :), please wait an hour for it to dry to cover the surface. - Do I need thinner for this white base 1000 to dry? Since are using the bottles, you should thin them with a 50:50 or a 60:40 ratio to prevent "cobwebbing". "Cowebbing" - means the primer dries as soon as it is sprayed out of an airbrush, leading to an effect that looks like spider webs.